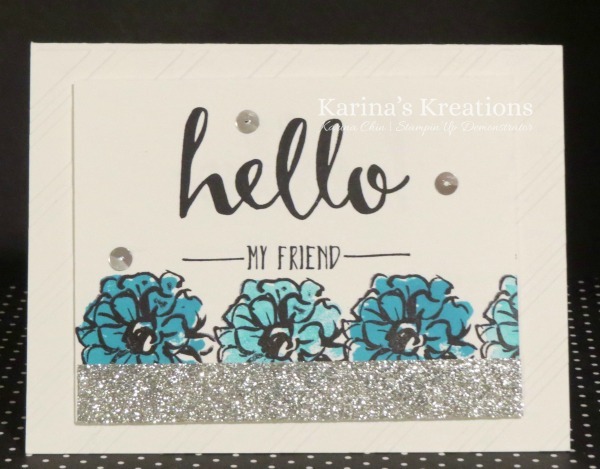 Karina's Kreations: Stamp it My Way Sale-a-bration Card! Stamp it My Way Sale-a-bration Card! I'm hosting a Sale-a-bration celebration party on Sunday April 10 from 1:00-4:30. It's a free party with lunch, make and takes and prizes. You can earn your invite by ordering $180.00 in stamping supplies from Jan -March 31 or if you're part of my Krafting crew team and promote or recruit from Jan-March 31. There's still time to get your invite. This could be one of the cards we make. This cute card uses the Hello and What I love Sale-a-bration stamp sets as well as the Glitter tape. The What I love stamp set and Glitter tape are free with a $60.00 order. This card design is also the stamp it my way card challenge this week. The challenge is to make a card with a 5-1/2" x 8-1/2" Whisper White card base and a 4" x 5-1/4" Whisper White card layer. Post it here and I'll enter your name into a draw to win a prize.